LOS ANGELES -- The Los Angeles Lakers fired their first coach just over a week into the season in large part because of the team's struggles running the Princeton offensive system. Now, they're not even really running one. "We don't have a system," coach Mike D'Antoni said before the Lakers cruised past the New Orleans Hornets, 111-106, at Staples Center for a third straight home victory. "We play basketball. The system is move the ball, play hard defense, space the floor and who's open shoots. It's not a difficult thing." But it is working, perhaps better than anything that's come before it. "Once you have a chemistry among your players, that are all happy with their roles, and they play hard, then who has the talent?" D'Antoni said. "We have talent. Now it's coming out." The Lakers' laundry list of issues and malfunctions this season is almost as long as their attempts to solve them. There were the behind-closed-door meetings. Several season restarts. Trade rumors and hurt feelings. Richard Mackson/USA TODAY Sports Kobe Bryant, the facilitator. There was the injury to Dwight Howard, the injury to Steve Nash, the injury to Pau Gasol and the injury to Howard again. Somewhere along the line Steve Blake missed 37 games and Jordan Hill was lost for the season, further depleting a bench with the depth of a kiddie pool. There's so much more, but we'd be here all day. Let's just say that the panic button is barely functional at this point. But after a 2-10 start to January dug the Lakers' hole in the Western Conference playoff race even deeper, D'Antoni decided to cast aside his trademark offense, the one that was supposed to turn Nash's clock back six or seven years and turn Howard into the league's most devastating roll man. 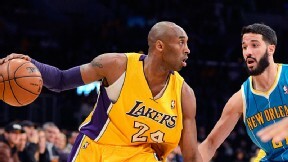 Instead, D'Antoni decided to strip the offense down and strip away some of the fortes or preferences with which his Hall of Fame cast entered this much-hyped experiment, including using Kobe Bryant, a shooting guard with a blood-thirst for points and over 30,000 of them to his name, into more of a distributor. "I'm like Neo out this m----- f-----," Bryant said. Chris Duhon, who ran D'Antoni's offense for two seasons with the Knicks, likened it more to playing pickup. Kobe, of course, was able to sum it up more bluntly: "It's not rocket science." In other words, D'Antoni is keeping things simple. "For me, that's the key: to not hold onto the past," Nash said. "We've got to adapt to who we are now. And I can't go all, 'Oh, I want to play the way I used to play, and Dwight [can't say], 'Well, I want to play the way I used to play.' And so forth down the line. Everyone's got to find out how we can affect each other positively together and forget about the past." As a result, the future has looked a bit more hopeful, and so have their playoff odds. The Lakers' offense opened Tuesday's game with a crispness and confidence to it. The Hornets would send a double-team at Bryant, but the 34-year-old guard always seemed to find the right pass to exploit it (Bryant tallied five of his 11 assists in the first quarter). Nash could be seen penetrating into the lane in the first quarter and, after drawing the defense, hitting Howard with a smooth dumpoff pass for an easy lay-in. Gasol even wrapped a pass around his head to Jamison, only to see the forward miss the gimme. Two players flirted with triple-doubles on the night -- Bryant finished with 14 points, 11 assists and eight rebounds; Gasol had seven, seven and seven -- and they weren't even the most eye-catching performances; those belong to Howard (24 points on 9-for-13 despite only four of the Lakers' 50 rebounds) and Earl "Earlsanity" Clark (20 points on 8-for-11 shooting, 4-for-5 from 3, 12 rebounds and four assists). Even L.A.'s four-man bench appeared potent -- Jodie Meeks had 13 points, Jamison had 15 points and seven rebounds and Blake finished with two points and four assists in his return -- helping to push L.A. to a 12-point halftime lead. "It's emotionally contagious," Bryant said about the team's new style, which has produced 102, 105 and 111 points over the past three games, and, more importantly, three straight wins. But offense, while a sore spot at several points in the Lakers' vexing 20-25 start, hasn't exactly been what's held the team outside of the top eight in the conference. L.A. came into Tuesday night ranked sixth in offensive efficiency but a mere 20th on the defensive side, and the shortcomings on that side of the ball came into clear focus as the Hornets stormed back to outscore the Lakers in each of the final two quarters. Down 18 at one point, New Orleans narrowed the Lakers' lead to one point with 2:04 to play. If not for an Clark lay-in and a Nash triple on successive possessions to push the lead to six, or a soaring Jamison lay-in off a Bryant hockey assist around the arc for a 109-104 lead with 15 seconds left, L.A. might be heading out onto its make-or-break seven-game Grammy road trip with another loss and not its first winning streak of three games or more since mid-December. Afterward, Monty Williams certainly sounded like a coach who watched his team let one slip away. But he was also well aware of what he was up against in the Lakers, regardless of which way D'Antoni was going to deploy them. "They have five or six Hall of Fame guys on their team," Williams said. "I don't think anything's simple about guarding them." Which is exactly the way the Lakers planned it. This time, at least. "I'm not surprised that, again, if you're not happy with your roles, if you don't pass the ball, and you don't play defense, I'm not surprised, you lose," D'Antoni said. "It's pretty simple. This is not a game that medical degrees are out there on the floor. We just play. Harvard hasn't won a title yet." Justin Verrier is an NBA editor for ESPN.com. Follow him @JustinVerrier. MVP: Dwight Howard, who finished with 24 points, five steals and four blocks. It's amazing how easy the game can be for him. He's been wary of the pick and roll, but it did him wonders tonight. That was ... worth the wait: The Lakers assisted on 34 of 39 made field goals. Whether this is a fleeting mirage or signs of a sea change, the Lakers are finally fun to watch on offense. Finally. X factor: Eric Gordon and Anthony Davis were highly efficient, both shooting 7-of-12 from the field. The rest of the team went cold for most of the night, but New Orleans' cornerstones had themselves a good night. MVP: With sincere apologies to Jarrett Jack and David Lee, this was Klay Thompson's night. The sharpshooting guard set career highs with 32 points and six makes from beyond the arc. That was ... surprising: The Warriors played without Steph Curry, Andrew Bogut, Carl Landry and Harrison Barnes, and Cleveland had won three straight games. Neither mattered as Golden State was in control from the opening tip. X factors: Kyrie Irving sat out the morning shootaround with a case of the flu, and the All-Star guard's symptoms clearly plagued him throughout the game. He had 14 points and four assists and shot just 5-of-17 from the field. MVP: LaMarcus Aldridge. Portland's All-Star finished with 29 points and 13 boards to spearhead the Blazers' comeback from 21 down. With 5 seconds to play, Aldridge hit his first 3 of the season to tie the game before sinking a game-winning turnaround at the buzzer. Incredible. X factor: In the 3rd quarter, the Blazers seemed dead to rights. The Mavs had a 21-point lead on them, but stormed back in the quarter with a smallball lineup featuring a major contribution from Sasha Pavlovic. Just like they planned in October. That was ... confounding: It's getting hard to keep finding words for the Blazers, who are defying logic and big leads as a matter of course this season. This win was doubly shocking because of the sheer number of fans who thought to themselves "no way ... not again." Short-handed Warriors: With four players missing -- including Stephen Curry and Andrew Bogut -- the tired Warriors could have mailed it in against the Cavaliers. But the trio of Klay Thompson (career-high 32 points), David Lee (20 points, 13 rebounds) and Jarrett Jack (26 points and 12 assists) led the rout in Cleveland. Pistons' final 36: Things were looking good for Detroit -- it enjoyed a 28-19 edge after the first quarter at home against the Bucks -- which then proceeded to be outscored 98-62 the rest of the way. Brandon Jennings' second-half explosion (20 points in the third quarter alone) will do that. It's probably a good thing Mark Cuban didn't make this trip to Portland. "I'm like Neo out this m------ f-----." -- Kobe Bryant, on going from scorer to facilitator during the Lakers' three-game winning streak. 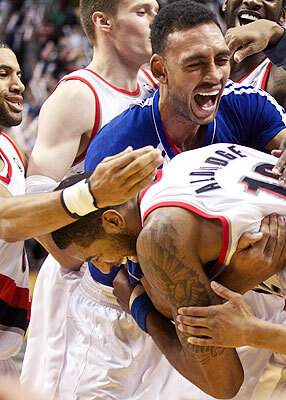 LaMarcus Aldridge is surrounded by teammates after making a last-second game-winning shot against the Mavericks at the Rose Garden. Rookie Andre Drummond registered 18 points and 18 rebounds for the Pistons in their loss to the Bucks. Drummond is the first Pistons rookie with that many points and rebounds in one game since Terry Tyler recorded 24 points and 18 rebounds on Oct. 17, 1978 against the New Orleans Jazz. MVP: Brandon Jennings certainly helped his hopes of replacing Rajon Rondo in the All-Star game. Jennings had 30 points -- 20 in the third quarter -- and six assists despite playing only 20 seconds into the fourth quarter. X factor: Andre Drummond notched a double-double in just his first 12:20 of play. He finished with 18 points and 18 rebounds, the second-youngest player since 1985-86 to post those totals. LVP: Will Bynum shot 1-for-7, turned the ball over twice and captained a second unit that blew the Pistons' 11-point lead in the first half. After that, the Pistons basically gave up -- which, to be fair, isn't Bynum's fault. Adam Stanco and Tom Carpenter discuss the latest injuries, Rudy Gay trade rumors and the new look Kobe. Plus, ESPNBoston's Chris Forsberg updates on Rondo and the Celtics.